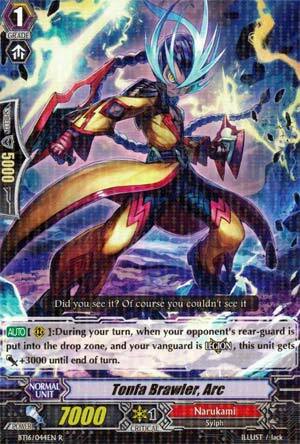 [AUTO](RC):During your turn, when your opponent's rear-guard is put into the drop zone, if your vanguard is Legion, this unit gets [Power]+3000 until end of turn. Next we have Tonfa Brawler Ark. When your Vanguard is in Legion and an opponent's rear-guard is retired, he gains 3k. Simple, that. Keep in mind the death of RGs can be by any means, be it battle, or skill, so he works with your starter, Fighting Dracokid. Kill the front row with the Vanguard, then use Dracokid's skill to eliminate the back-row. Combined with Knuckle Buster, this could completely board-wipe for a total of CB3, although don't count on this, for a whopping 15k bonus power. Shame he doesn't play nice with the Stride option for the Brawlers in Fighter's Collection 2015, but he's still an overall solid choice and another basic staple for now. A quick and simple unit, when you're in Legion, if your opponent's rear guards die, whether in battle or by a card skill, which affects four of the five Brawler Legions, if there's a sixth one, I can't recall it, it gets +3000 for each unit retired. And, yes, like yesterday's card, it stacks, so smash four rear guards with Big Bang Knuckle Buster and get +12000 for the booster. Overall, very solid unit and a staple for Brawler decks.